There are a lot of details to consider in a bathroom remodel. You may know exactly what you want or you might not have any idea. Either way, going in with a plan will help ensure the contractor is able to give you a remodeled bathroom you will be happy with. If you already know what your dream bathroom looks like, start by putting it on paper. Write out all the details you’ve been dreaming about. You can even sketch out some ideas and gather inspirational pictures if that’s what you prefer. Any information you can provide about the end result you want will help your contractor bring it to life exactly the way you’ve imagined. 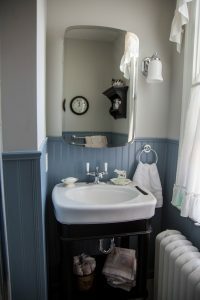 If you have no idea what you want your remodeled bathroom to look like, you can still go into the process with a plan. Instead of focusing on the end result, which can be overwhelming at first, try focusing on your current bathroom. Is there anything you like that you want to keep? What don’t you like? What frustrates you about your current bathroom? Gathering some notes on questions like these will help your contractor work with you to develop a bathroom you will love. Knowing what you like and don’t like about your current bathroom is a good start. With that in mind, you can think about how you would like your remodeled bathroom to function. Do you need more counter space or a double vanity? Do you want to replace your current shower/tub combination with a walk-in shower unit? Taking a moment to think about the limitations of your current bathroom and how you want your new bathroom to function can help determine the layout, features, and more. Once you have a layout narrowed down and the basics figured out, then you can work with your contractor to pick out all the details including the flooring, lighting, and fixtures. When it comes to your bathroom floors, you want something water-resistant or waterproof that also looks good. Tile is a classic floor choice. Baseboard tiles are durable and add an elegant touch. Tiles also come in porcelain, stone, and ceramic. You can also get a tiled or wood floor look with laminate. Lighting can make or break a bathroom. Ambient lighting is usually the best for bathrooms. You don’t want it to be too bright or harsh, especially early in the morning. Consider the placement of any windows in your remodeled bathroom, how much natural light you may get throughout the day, and the placement of everything else to figure out the lighting that’s right for you. Recessed lighting can add some extra light without overwhelming the room. Skylights or sun tunnels can be a great way to illuminate the room with natural light. You can also install dimmers to allow you to adjust the light as you see fit. There are plenty of bathroom lighting options available to achieve the atmosphere you want. You will have figured out some of the basics for fixtures during earlier planning stages. With the big decisions out of the way, you can get detailed. What kind of tile designs do you want in your walk-in shower unit? Pedestal sink or large countertop? Do you want a single or double showerhead? How about the faucet on the sink? The fixtures are the staples and finishing touches to your bathroom. The options for a bathroom remodel are endless. It can be overwhelming at first, but you don’t have to go through it alone. Call Zephyr Thomas at 717-399-4708 for help with your bathroom remodeling project! We’ll work with you every step of the way to ensure you get the bathroom you want.